This week was an exciting one for the kids because we were blessed with snow! I know this doesn't seem worthy of excitement, but we're in the middle of winter and it's only snowed a handful of times here in Boston. The epic winter of 2014 is quite recent in my memory so any time I hear it's going to possibly snow I scramble to make sure everything is in order. This includes my car emergency kit, replenishing snacks and water in the car as well as my snow scraper/brush. My old one is cumbersome and super long, which is great for reach, but not very practical with all the stuff we keep in our car, so when Kungs reached out to me I was curious to see how their smaller scrapers and brushes would stack up. Kungs is a Finnish company, but new to the U.S. Here's where a bit of Lovebird trivia comes into play: Mr. Lovebird used to play basketball in Finland when we were dating, and I've been...during winter. Winter there is on another level! I still have flashbacks of how much snow (and darkness) we experienced there. If anyone is to be trusted with snow gear, it's definitely the Finnish! I received a Max-Is snow brush/ice scraper and a smaller Mid-Is ice scraper. 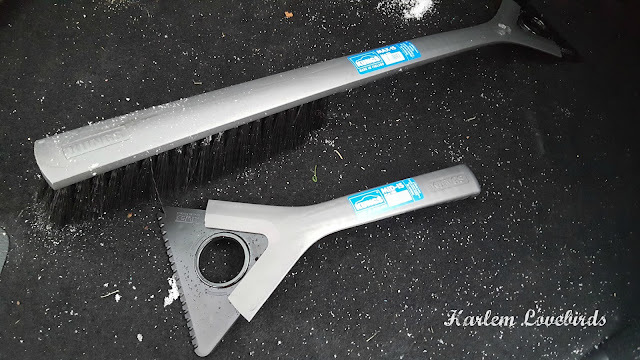 While the kids were happy to help in their own way, I gave the brush and scraper a try on our family-mobile and was able to break through the ice with ease. 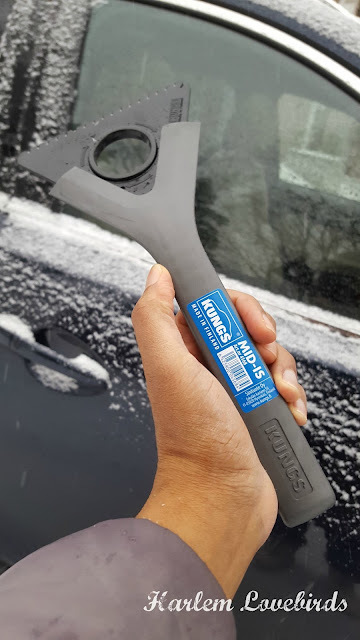 The handles on both are comfortable to hold, plus the notches on the triangular blade helps break off ice on the windshield wiper blades. I can get obsessive when it comes to cleaning off my car and getting all those little bits off! Kungs handles them easily. 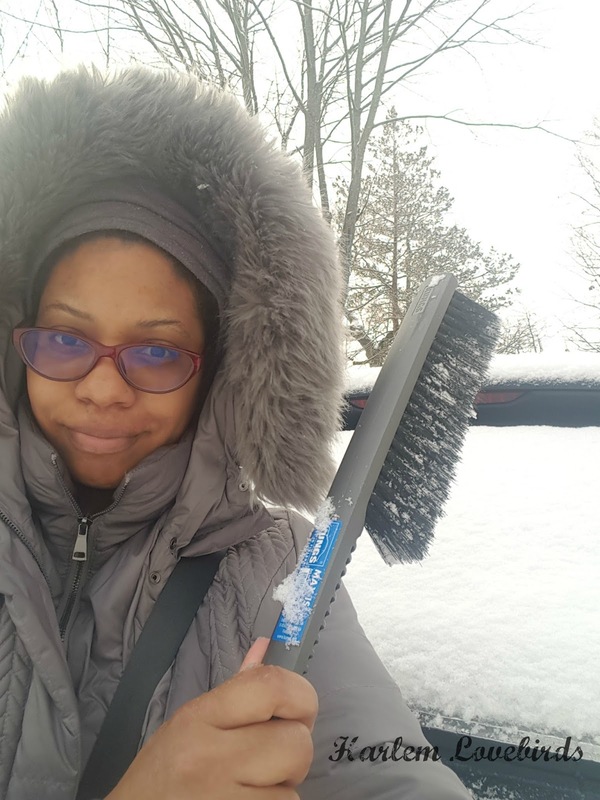 The shorter length of the brush wasn't problematic for cleaning off my windshield, but a longer length would be helpful for getting snow off the roof of the car. If I have enough time before running Nia to school I'll try to knock it off up top so it doesn't blow back on other drivers or dangerously slide down my windshield. Has that ever happened to you? It did to me once on the freeway in New Hampshire, and it was so scary! I learned my lesson. You can find Kungs at your local Sears Auto Center, and you can check out their full product line here on their website. Is winter abnormally mild where you live? 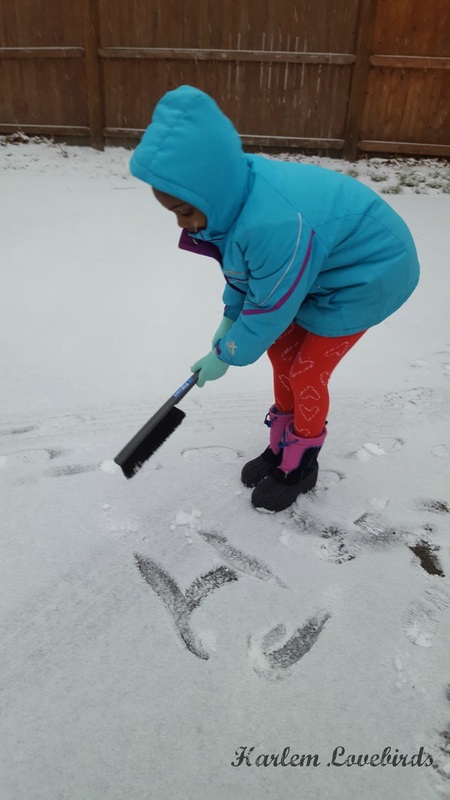 Are your kids anxious for more snow?